The following guidelines apply to all videos submitted for the competition. The organizer of the competition is Deutsche Bank AG, Taunusanlage 12, 60325 Frankfurt am Main (referred to in the following as “organizer”). Participants must be at least 18 years of age. Each registered participant can only submit one video. Otherwise the participant will be excluded from the competition. If a video is produced by a team, only one person from the team must register, provided that the other participants have transferred the rights of use to this participant. Participation in the competition is free. The organizer’s decision is final. Videos can be submitted that deal with the city of the future. Taking the film classic “Metropolis” as a point of departure, and within the framework of the 100th anniversary of UFA, video submissions are sought that provide a futuristic view of the submitter’s own city or the metropolis of the future in a visual and artistic way. Video entries can be between 100 seconds and 10 minutes long. The opening and closing credits are not included. Videos that do not meet the length requirements cannot participate in the competition. In the introduction to the video, only the title of the competition, the title of the work (film title), and the name of the participant can be faded in. Videos can be submitted in the following formats: mpeg4, avi, mov, wav. Videos can be submitted exclusively in digital form via the website www.machtkunst-berlin.de until June 30, 2017, at 12 midnight. After the submitter fills out the online registration form and accepts the conditions of participation, the registration will be confirmed by E-Mail. The project name: the name that will be used for the entire communication and media reporting on the project. A short description of the project. This description should not exceed 200 words (German or English). The participants agree to the use of the short description within the competition as well as the translation into other languages. The short descriptions can also be used for an introduction. For the pre-selection, the videos must be submitted in the original version. Videos in German or English do not have to be translated. Videos in other languages must have English subtitles. Furthermore, the organizer reserves the right to provide videos in German with English subtitles in cooperation with the participant. It is not possible to submit videos by mail or to deliver them in person. Videos with anti-constitutional or pornographic content, with content that glorifies violence, discriminates against minorities, or that is generally illegal will be excluded from the competition. The winners of the competition will be selected by an expert jury. The jury will be appointed by the organizer. The jury’s meetings are not public. After thorough deliberation, the jury will vote and the winners will be determined by majority rule. The decisions and evaluations of the jury are incontestable. After the submission deadline, the jury will view all of the entries and select a shortlist of 20 entries. Out of these 20 entries, the jury will pick three winners, from first to third place. 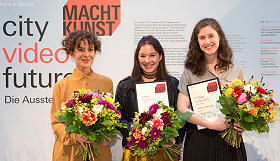 The shortlist will be presented in a public exhibition on August 19 and 20 in the atrium of Deutsche Bank Unter den Linden in Berlinin the context of the 20th Long Night of Museums. The organizer reserves the right to present the film at additional locations. In addition, the audience has the possibility to select its favorite video from the shortlist in the exhibition on August 19 and 20, 2017 (by ballot) or online from August 21 to 27. If there are irregularities or if manipulation is suspected, the organizer reserves the right to exclude the entry in question from the competition. The jury prizes will be announced on August 19, 2017, at 7 pm in the atrium of Deutsche Bank Unter den Linden during the exhibition opening. The audience prize will be announced online on August 28, 2017 (7 pm). All shortlisted videos can be published on the Internet (website or social media platforms) for the duration of the competition (May 15 to August 28, 2017) and during the exhibition on August 19 and 20, 2017. The participants whose works are shortlisted will be notified by email by August 10 and will receive an invitation to the exhibition and awards ceremony in Berlin. Travel and accommodation costs will be borne by the organizer. But they have to be agreed upon with the organizer in advance. The participant is responsible for clearing all rights to use the submitted video within the framework of the competition. The participant declares that he or she is authorized to permit the organizer to use the submission and that use of the submission in the framework of the competition does not violate the rights of any third party (e.g. copyrights, performance protection rights, personal rights, name rights, or trademark rights), and particularly clears the rights of use of third-party material (music, film, photos, texts, etc.). The participant shall exempt the organizer in this regard from all claims made by third parties regarding use of the submission during the exhibition. This also encompasses necessary and appropriate costs for legal defense. The participant shall not receive remuneration for granting usage rights. The right to present the video on Internet pages (in Germany and abroad), with partial or complete publishing of the video and / or photos (stills) from the video, as well as on the Internet, including making it available to the public via a full-text search and in databases, or by using parts of the video in the organizer’s public-relations work. Until the day of the awards ceremony the participant will refrain from licensing the film to third parties for commercial usage or to use it for any other commercial purpose. Furthermore, the participant expressly agrees that the competition entry may be used free of charge by the organizer for further presentations and projects until the end of August 2018.